Actors to architects, journalists to tattooists  the city wants to hear this month from anyone in Chicago's creative community. 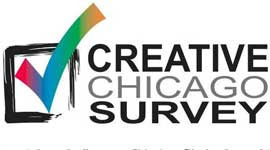 A web survey will aid the city's Cultural Affairs and Special Events department develop programs, artist spaces and "projects yet to be imagined," according to Chicago Artists Resource, a city website suggested in a similar survey from 2000. That census drew largely from visual artists such as painters, sculptors and photographers. A review of the results led the city to mount its annual Creative Chicago Expo workshops, a loft shopping guide and other projects for artists. This year's anonymous poll, which the Wicker Park-Bucktown business-improvement district promoted last week, looks for people who identify with a wide range of creative endeavors in academia, creative writing and marketing as well as performance and visual arts. The survey asks about your business and workspace, and which efforts would most help support it. The city last year merged Cultural Affairs and Special Events into a combined department, laying off arts staff or moving jobs to a tourism board. Will a spot poll suggest new uses for dwindling resources? At least it's creative approach.